The day Daniel Harper inherited his uncle’s old farm, he also inherited a strange key. When he used that key on the cellar door, he found himself not on the rotting wooden steps, but in the path of an oncoming car on a dark city street. He’s just stepped into Ether, a world of steam powered cars and wooden ships that sail the skies. The key to going home is the key that brought him there, but he’s left it in the cellar door. Now his best chance of finding the way back is to go along with Ether’s most wanted criminal and former bodyguard to the murdered King in the hopes of finding another key. Ether has not been tagged yet. Help others find Ether by tagging it! 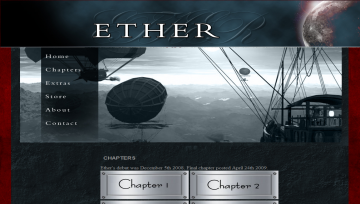 Ether has not been reviewed yet. Ether has not been recommended yet.